Please introduce yourself and what you wish to accomplish/reveal with your photography. My family are all very creative - my father did a lot of painting in his spare time, my mother was interested in photography and art and my grandfather was an artist all his life. This certainly inspired me to pursue a career in the arts and I attended art college and studied furniture and product design at university. The interest in photography was a combination of a number of things, such as - when I was young, I was lucky enough to travel to some fantastic locations such as the Alps, Lake District (UK) and Scotland and had an appreciation for large open spaces. This love of the outdoors and interest in art & design inspired me to pick up a camera and allowed me to document my experiences. However, it wasn’t until 2002 that the digital market allowed me to fully control the whole process from my living room and I invested in some more serious equipment. I've always liked clean design, minimal modern art, simple compositions in landscape paintings, symmetry and balance. So it always made sense to me that when composing a photographic composition the image should be simplistic and uncluttered. This minimal style then reflects a calm sense of mood which is my overall intention. I'm drawn to water, so you will see this appearing in a lot of my photographs throughout my work. 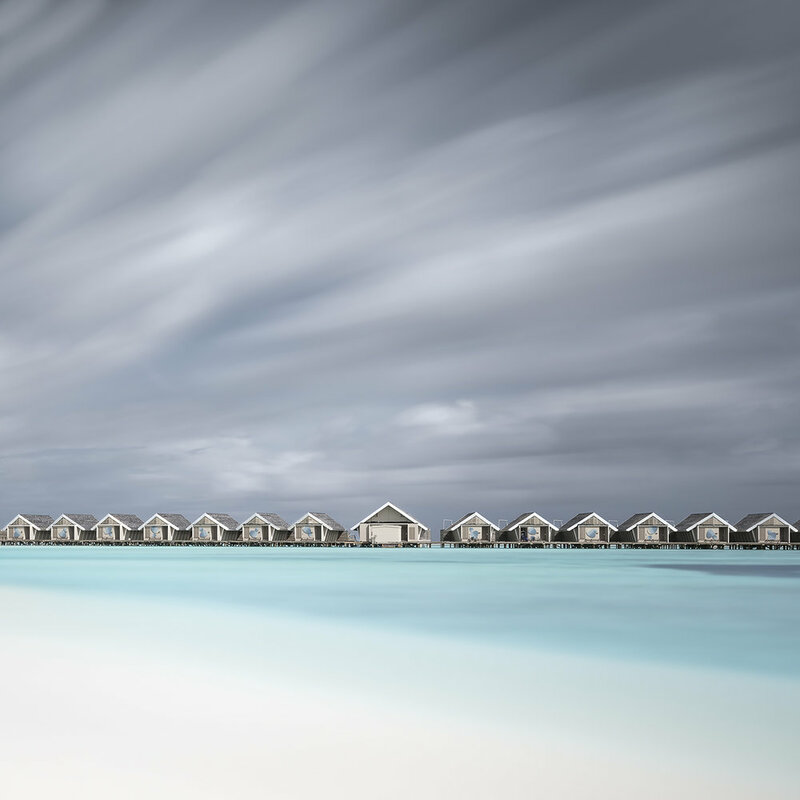 Beaches, lakes, oceans, they all hold photographic opportunities due to the changing reflective light, the movement and the mood that water can produce with long exposures and the right conditions. When taking a photograph I look for the interesting details and try to break down an image into a manageable format. The images are also self reflective and ultimately point towards self satisfaction and that pursuit of perfection. I suppose its my way of feeling free from the chaos of life, its my yoga for the mind! Tell us how you got started with photography and why. To some extent the above answers this, but photography gave me the chance to document how I see the world. It’s not just about sharing the beauty of this planet with others, for me it’s a little more than that. I've always been more interested in shooting less recognisable locations as it adds more intrigue to the photograph. But the locations I pick are mostly related to environmental concerns, historic traditions or how humans are interacting with the planet. I feel it’s important that all of us contribute to spreading awareness of climate change etc no matter how small our voice may be. All of the above. I’m represented by a number of international galleries, sell prints online, trade fairs, magazine contributions, commercial work locally and internationally and I’m currently looking into the world of publishing at the moment. How do you decide if a photograph is good enough for your portfolio/to sell? Tough one..as most of us are our own biggest critics! I tend to rely on gallery curators, fellow photographer colleagues, social feedback and leaving a file on my computer for a couple of months, to then return and make a call. How/when did you make your first sale? My first print sale was on ebay! I sold an abstract photograph of some poppies in 2003 to a very pleasant customer. I can’t remember the price, but the feedback he left was very good. When did you know that making a living off art was feasible? You never really know if you can, like most artists / photographers it’s a gamble. You just have to believe in yourself and work very hard. Each RAW file can be different. I’ve opened some files straight out of camera and added only a small amount of dodge and burn, clarity and sharpening and in10mins it’s finished. Where as some images for clients can be a bit more complicated when there is product placement within the photograph. It took me almost a whole day to process one image for LG Electronics, but the overall result was just what the client was expecting. In general terms, my black and white images consist of gradients, a small amount of masking, dodging and burning to provide the contrast as well as sharpening. I steer clear of removing anything in the image unless it is a badly placed telegraph pole, smudge or a smear. Canon 5Ds & 5D Mark ii, Canon 16-35mm, Canon 24-70mm, Canon 24-105mm, Canon 70-200mm, Canon 50mm, Manfrotto Tripod, Lee Filters (Grads/ND), Lee Foundation Kit, 55mm Hoya Polariser, Canon Cable release, x3 Lowe Pro bags. No real reason I use Canon over other brands, it just so happens the first digital camera I ever bought was Canon. Always purchase quality equipment as it is certainly worth the investment in the long term. Very good question. Researching preferred locations tend to be my starting point and once I’ve selected a suitable region, I might use Google Earth in order to scope out the lay of the land. This will allow me to pinpoint areas of interest, I then begin to understand how light may rise and fall using other apps and save locations to Google Maps. However, a large number of my compositions can also be ad hoc, once I arrive in a selected location the environment may offer something new and unexpected. As I’ve outlined, I’m drawn to water, so you will see this appearing in a lot of my photographs throughout my work. What do you do to market yourself and get more reputation/leverage in the art world? For me, it’s the strength of your portfolio (be selective), the consistency of style within your work, strong communication socially and within the art circles, online marketing, website presentation, determination and hard work. But there is no right or wrong answer here, it’s personal and it depends on what the overall goal is. Do you have any advice for artists looking to get into galleries? Who to contact, how to tell if a gallery is fitting, etc. This is subjective and really depends on many factors, but again it comes down to hard work and not giving up. Make sure you align everything to how you wish to market yourself, almost like a brand. How long did it take for you to develop your own, personal style? How did you do it? I still don’t really know if I have my own style. I think this is something that starts to become consistent based on many factors – composition, approach, post-processing, influences, interests and how you wish to be perceived as a photographer. I’ve never really decided on a style, I suppose it’s a reflection of all my influences in life, which might include, artists, photographers, designers, films, books, interest in the outdoors even the music I listen to can develop ideas when I’m post processing. The style is a collaboration of many things and maybe it’s channeled by the burning desire to be a little different from others. But as they say, nothing is truly original anymore! Do you make your prints at home, or outsource them? Why? All outsourced to my gallery in Dubai as they know what they are doing and I don’t! Don’t get me wrong, I have input on materials and process, but I tend to leave it to the professionals to make the last call when it comes to printing. How do you decide on edition sizes? I tend to keep my fine art edition sizes relatively low between 10-15 as I feel this is more aligned to a collectors market and I prefer the idea of smaller print runs. However, some of my work is used commercial in Brazil for example, where hotels, offices, bars may want higher volume editions. These images are not aligned to the fine art prints I sell in solid brick galleries. Any advice for how to price your work without feeling as though it is undervalued? How much would you pay for your own work is the question I would always ask, but as most photographers / artist are their own biggest critics, this does not always run true. Gallery curators are probably best placed to price your work based on estimates by the photographer. As your work becomes more collectable the price will then go up in parallel. But if you are just starting out, then compare your work to other photographers selling their work online who are at a similar level of expertise. Thomas Heaton for example sells his work relatively cheaply, as I presume he is aiming at a wider audience, but we may see the price of his work go up if he continues to attract global interest. What would you say are some of your biggest accomplishments so far in life? Outside of photography? Probably climbing Mont Blanc in France, travelling across Australia for 4 months solid in a combie van, travelling the world and of course marrying my beautiful wife and having two beautiful children! Who inspires you in life? in photography? I’ve always been inspired by musicians, artists, designers and even mountaineers. So I suppose this comes back to creativity and the outdoors, the two main drivers behind what I do. Photographers that inspire me include Michael Kenna, Michael Levin, James Balog, Ansel Adams, Nick Brandt and David Yarrow. These photographers each hold a distinct style that transpires into beautiful fine art photography which appeals to my personal taste. Whether it's their technique, composition, mood, tone, subject or colour, each will inspire me in some form or another. Art has always been close to my heart – Turner, The Impressionist’s, Canaletto, Rothko, Braque the list goes on……currently big inspiration is Zaria Foreman and Ian Davenport. What advice would you give yourself if you could turn back time? I would probably tell myself to look less at other photographers work and concentrate my energy into my own work. In the past I was guilty of endlessly comparing my work to others, which would ultimately demotivate me due to the disappointment in my own portfolio. Emails, Emails, Emails, followed by post-processing, researching new projects/locations, invoices, calendar updates etc. I’d love to say I’m out with my camera everyday, but shoots tend to be pre-organised unless the weather conditions locally are exciting and I’ll grab my stuff and go! If you have enjoyed this interview, be sure to check out Anthony's website and give him a follow on Instagram!